Electric locomotive 1216 019-0 with advertising Achenseeschiffahrt of the Austrian Federal Railways (OBB). Epoch VI.The model has a built-in load sensing digital decoder and sound true to the original from factory.Finely detailed model that features 4 pantographs. Triple headlights and two red tail lights. LED lightings. Motor with flywheel. Drive on four axles, two of them have traction tyres.Digital interface according to NEM 651 standards for the adaptation of a decoder. Coupler pocket according to NEM 355 standards and close coupling mechanism.A ship on tracks: The 10.000 hp strong OBB Taurus locomotive of the series 1216 019-0 which operates between Munich - Innsbruck - Verona / Bologna / Venice, impresses with its very eye-catching exterior design. A modern ship of the Tyrolean Achenseeschiffahrt is operating on cross-border tracks for the first time. 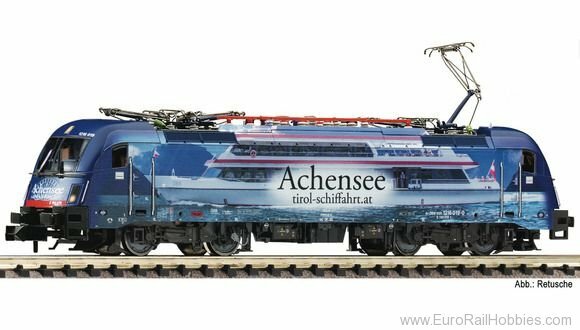 The passenger ship of the Tyrolean Achenseeschiffahrt is depicted on the side walls of the locomotive. Are there any better ways to get to the Achensee than taking the EC trains of the DB or OBB from Italy or Germany directly to Jenbach?